Bono, a dragon-like creature, lives in a castle in the sea and has specialised on the manufacturing of soap for the huge monsters that bathe in the sea around the castle. To produce a piece of soap, he needs to collect 5 skeletons (by walking over them) and then put them in the kettle (touch the side of the kettle). Skeletons can also be behind gates for which a key is needed. 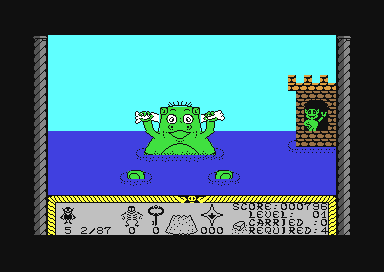 He then needs to carry the soap up the stairs and bring it to one of the 5 waiting bathing monsters. After the sale the gravity changes (always into the direction of the door). Each section of the castle contains 25 skeletons. So Bono an make exactly the 5 soaps for the 5 monsters from them. 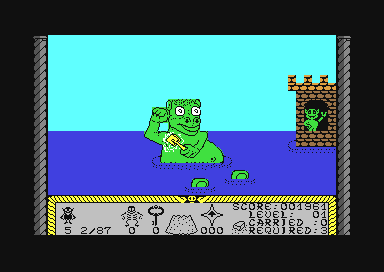 When all monsters are provided with soap, Bono gets a password and goes to the next of the 22 sections (levels) of the castle. By jamming them with the help of a Glook, by this they turn into a skeleton. A Glook? ?, what is that? Well, a Glook is a strange blobby thing that loves soap. When it smells soap, it will happily follow the smell. The direction into which the wind blows the smell is shown on the wind meter at the lower border of the screen and below that is a counter that shows when the wind is going to turn. A single Glook can be pushed around by Bono, several behind each other pose an unsurmountable obstacle. A Glook is only dangerous for Bono while in movement, but it can block paths. With the help of Bono's friend "Fozzy", who unfortunately is only slightly more intelligent than a Glook and runs around a bit confusedly, he can keep away these unpleasant contemporaries from Bono, so he can pass them. Unfortunately, he has only a limited time span. While collecting, Bono always needs to have an eye on his friend Fozzy so that he is not locked in. 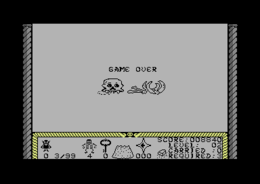 A third possibility is to lure the opponents into a trap door, but then Bono cannot collect the skeleton any more. And then there are also those spiders. These awful things are absolutely invulnerable but can lead to instant death. They mostly wander around in the corners of the rooms, walk at the rightmost and eat everything, also the so urgently needed skeletons. But Fozzy is a hard nut to crack, he is immune against them. 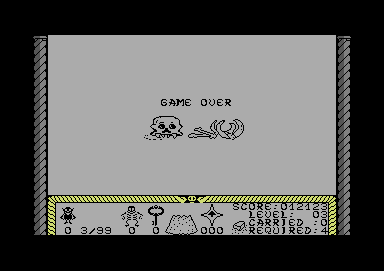 Sledgie: "BoneCruncher is my favourite game on the C64. There is a lot of fun mixed with a good portion of wit. If you like Boulder Dash, you will love this game!" H.T.W: "A really interesting small game that makes you quite brood over it in the later levels. 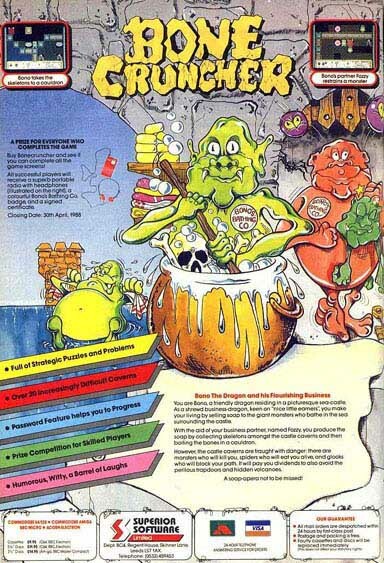 You do not only have to remember the buildup of the labyrinth, but also time the paths of the goblins so exact that they are reworked to skeletons by the Glooks, as you definitely need them to get 5 skeletons for a soap. The graphics is fun and the sound fits, unfortunately, a saveable highscore list is missing." This page was last modified on 8 January 2017, at 19:15.